Peru – country located in western South America, on the Pacific Coast, north of Chile. Peruvian territory was home to several ancient cultures. Ranging from the Norte Chico civilization in the 32nd century BC, the oldest civilization in the Americas and one of the five cradles of civilization, to the Inca Empire, the largest state in pre-Columbian America, the territory now including Peru has one of the longest histories of civilization of any country, tracing its heritage back to the 4th millennia BCE. The Spanish Empire conquered the region in the 16th century and established a Viceroyalty, which included most of its South American colonies. After achieving independence in 1821, Peru has undergone periods of political unrest and fiscal crisis as well as periods of stability and economic upswing. 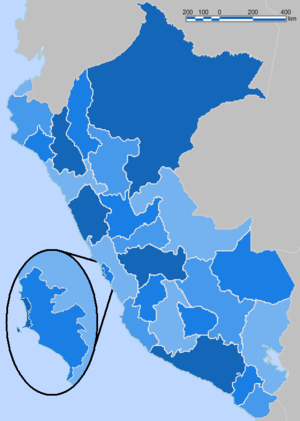 Regions of Peru Peru is divided into 25 regions and the province of Lima. 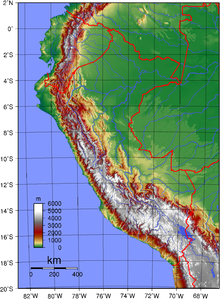 Clickable map of the regions of Peru. ^ "Peru". The World Factbook. United States Central Intelligence Agency. July 13, 2009. Retrieved July 23, 2009. This page was last edited on 21 March 2019, at 18:23 (UTC).